….The historic temperature pattern we observed has abrupt dips that match the emissions of known explosive volcanic eruptions; the particulates from such events reflect sunlight, make for beautiful sunsets and cool the earth’s surface for a few years. There are small, rapid variations attributable to El Niño and other ocean currents such as the Gulf Stream; because of such oscillations, the “flattening” of the recent temperature rise that some people claim is not, in our view, statistically significant. 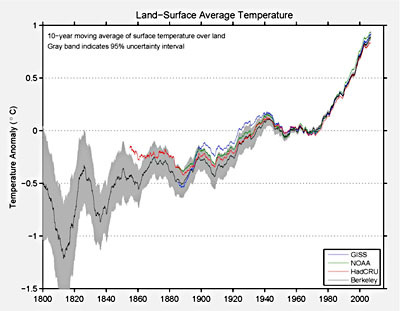 What has caused the gradual but systematic rise of two and a half degrees? We tried fitting the shape to simple math functions (exponentials, polynomials), to solar activity and even to rising functions like world population. By far the best match was to the record of atmospheric carbon dioxide, measured from atmospheric samples and air trapped in polar ice. ….The careful analysis by our team is laid out in five scientific papers now online at BerkeleyEarth.org. That site also shows our chart of temperature from 1753 to the present, with its clear fingerprint of volcanoes and carbon dioxide, but containing no component that matches solar activity. Four of our papers have undergone extensive scrutiny by the scientific community, and the newest, a paper with the analysis of the human component, is now posted, along with the data and computer programs used. Actually, Muller’s new paper doesn’t appear to be online yet. It’s going up tomorrow. When it does, I’ll take a look at it and post their charts for you. However, as near as I can tell, climate skeptics, including those who said they’d trust Muller’s results no matter what they showed, haven’t budged an inch since he published his initial papers last year. I doubt his new paper will change their minds either. That’s no surprise, since this has long since ceased being a scientific controversy. Climate skeptics are skeptics because they don’t like the idea of global warming, not because there’s truly any evidence that it doesn’t exist. It’s politically inconvenient, economically inconvenient, and personally inconvenient, so they don’t want to hear about it. I wish I knew what more we could do about this. It’s pretty plainly the biggest problem facing the human race at the moment. By comparison, everything else is about like arguing over whether the deck chairs on the Titanic will help keep people afloat when the ship sinks: obviously they won’t, but the debate acts as a nice distraction. But if people don’t want to believe for reasons of personal/political/economic self-interest, how do you convince them? What kind of self-interest can we fight back with? Because at this point, it’s pretty obvious that neither science nor the future of our grandchildren is enough.